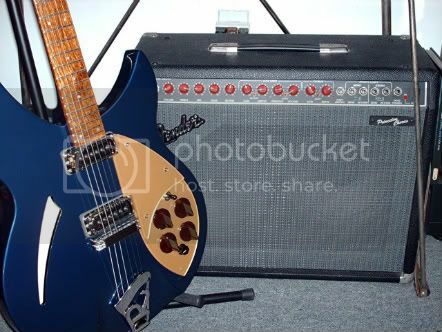 Since we all got the coolest and yet most awesome, beautiful sounding guitars on this planet, I'd think we share what kind of amp's the RIC's play through. PS: Would be fun if you mentioned your model of the RIC. 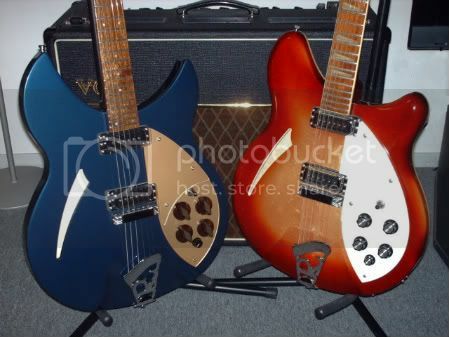 I use my Rickenbacker 360/6 MG with *hehe* Vox Pathfinder 10.... Beside I use.... *that awkward moment* Vox AC1... Planning to by a JMI 100 head! There's been a few threads about this, but cool. I use a part digital rig, which includes all my analog pedals, plus an early model Digitech RP-150 processor. Those pedals go into a Fender Champ 600, which has different tubes than the original models, and that is used for a head into a Line6 Spider II cab with Celestion speakers. The Digitech Processor is used for amp models and various sounds. I've used this rig for most of my recent recording work. I actually discovered this setup on accident. I have used my Champ 600 for a head before, but was using a Fender Virbrochamp with the cabinet for a long time. When I plugged my 620/12 into it, I fell in love, but felt the amp needed some guidance, so originally used my Digitech processor only for the EQs, but found it convincingly got Vox and Marshall sounds, so it stuck. If you added up all the expenses of this setup, it wouldn't come close to the same price of a good Vox or Marshall amp, but it sounds fantastic, and I pick it over my other amps. Currently, Vox Cambrdge, Rickenbacker TR7, and Randall RG80 amps. All small combos with reverb. Years ago I had a Vox 125 and a Fender Super Reverb that i would swear by... But i don't need that kind of wattage anymore. Both sound great, but the Princeton Chorus really is phenomenal with either Ric I own. That's the one that gives me my favorite tone. Usually play my 360 through a mid-60s Sears Silvertone 1482. Butter. I've got a Cornell Romany Plus which is like a champ but with a 12 inch speaker. I replaced the Jensen with a Tone Tubby Alnico and that's opened up the amp. I've also got a mismatched head and cab. The head is a ZVex Nano and the cab is a Pacific Woodworks Theile 2x12 with a EVM12L and V30. I did use a WEM 15w head until it blew up, so I am thinking about another Vox type head and some alnicos in the cab. My 1974 360/12 sounds tremendous through my Roland JC120. Fender Twin Reverb RI modified to be quiet.I can use one or two speakers.Each one has it's own patch cord.One in the external jack and one in the speaker jack.I pulled some tubes and replaced the 6L6 with 6V6.I have a pull pot on the vibrato for different vibrato sounds.I had the "ground " switch modded so I could have a low watt setting and a higher output setting. I kept one of the stock Jenens and put in a Weber 12f150. The amp was used and had some wear so I went for the mods and I love them.The amp was so loud before that it was unusable at home without serious ear pain.Great mods.Great sound.Possibly some kinks to be worked out,but really happy with it at the moment. Using a Boss GE-7 EQ and an Ibanez Tube Screamer TS808 for effects. My guitar is a Ric 620 12 string. It's my first Ric and my first Fender Twin.I now have the set up to play the music I want to play! I wanted a rhythm guitar sound that sparkles.I finally found it!I feel I've been wasting my time with gear until now. I never considered a Ric because I just thought they were somehow too elite.I would go to the guitar store and play a bunch of guitars and then want to get a Les Paul or a Jazzmaster and my girlfriend pointed out to me that I talk about getting all these other guitars,but when I strum on an unplugged Ric it sounds like it suits my style of playing more than the other guitars.Then I realized she was right.I just didn't think I'd ever buy a Ric.Now I wish I had bought one years ago.I traded in my Marshall and my Les Paul the next week.I wasn't creating on them.All I could come up with were riffs that I wasn't really interested in playing,that didn't match the right sound for the music I wanted to play.They were nice,but not for me. It's fun to be excited to play again! Any Vox AC30, or Fender Blackface RI, usually. I've also been abler to get some killer sounds out of a B-52 or Jughhes/Kettner playing through a 4x12 cab at jams or rehearsals. I've even been able to coax a good sound out of those awful modern Marshall amps with two rows of a full face of knobs and multiple channel switching (what a PITA! ), though that's a bit more of a chore. I like to keep my amp setup relatively simple; I'm a pedal board nut, though I've gone without those as well.